Drivers seek City injunction against rival company. Give yourself plenty of transit time today: from 7:30 a.m. until 7 p.m. cab drivers will refuse fares in protest of ride-sharing service UberX. As many as 2,000 drivers have joined in a downtown demonstration, clogging major transit routes in the process. The Toronto Star reports slowdowns southbound on Highway 427, the Don Valley Parkway, eastbound on the Gardiner, and around Queen’s Park Circle. 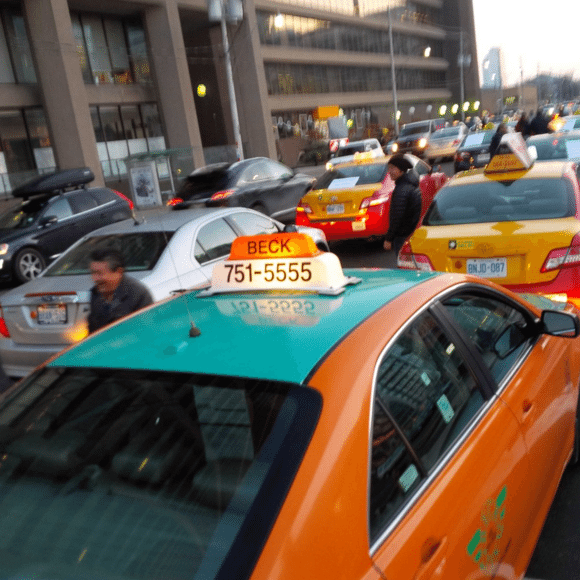 John Tory stated that 190 charges have been laid against taxi drivers today. Taxi drivers also demonstrated outside City Hall, shouting slogans as John Tory conducted a meeting on the second floor. They have since filled the council chamber for this afternoon’s meeting. Sajid Mughal, president of the TaxiWorkers Association, told The Star that the ultimate goal of the demonstration is for the City to seek an injunction to shut down UberX while city staff work to create new bylaws.